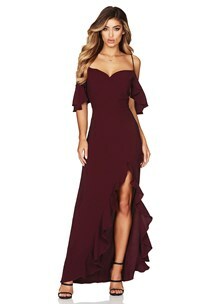 Romantic off shoulder maxi dress with gorgeous frills over the shoulder and on the hem up the side leg spilt. Featuring a soft draped neckline, made from textured crepe. Adjustable straps, invisible zipper closure at centre back.